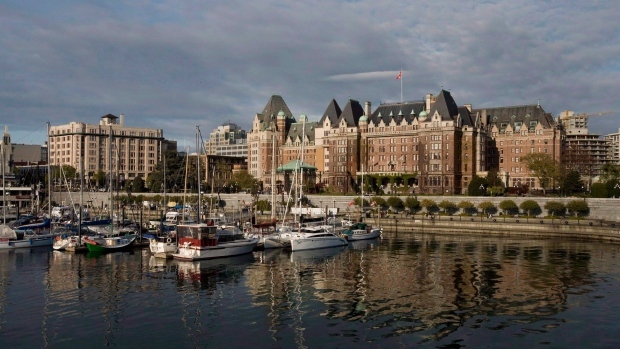 VICTORIA -- A Nova Scotia man banned from Victoria's stately Fairmont Empress hotel is welcome back after apologizing for an incident more than 17 years ago in which seagulls hungry for pepperoni trashed his room in a rock star frenzy. Nick Burchill of Dartmouth, N.S., says in a letter to the hotel he was young and immature in 2001 and unaware of the aggressive nature of West Coast seagulls, especially when tempted with a suitcase full of fresh pepperoni near an open window. "I remember walking down the long hall and opening the door to my room to find an entire flock of seagulls in my room," stated Burchill's letter. "I didn't have time to count, but there must have been 40 of them and they had been in my room, eating pepperoni for a long time." "They immediately started flying around and crashing into things as they desperately tried to leave the room through the small opening by which they had entered," said Burchill. "The result was a tornado of seagull excrement, feathers, pepperoni chunks and fairly large birds whipping around the room." Tracey Drake, the hotel's public relations director, said Monday there were thoughts this was an April Fools' Day prank, but a check of the records and Burchill's appearance at the front desk last weekend confirmed the seagull story and the former guest's permanent ban. "It is absolutely a true story," she said. "The hotel followed up with his employer afterwards, saying he's not welcome back at the hotel due to the damage in the room," Drake said. "He's correct. The lamps were broken. The room was trashed. It's a really funny story to tell 17 years later, but I was sitting here thinking about the housekeeper and what her first reaction must have been when she opened that door." Burchill's letter stated he still remembers the dismayed look on the housekeeper's face when she walked into his room. "I have matured and I admit responsibility for my actions," the letter stated. "I come to you, hat in hand, to apologize for the damage I had indirectly come to cause and to ask you reconsider my lifetime ban from the property." The letter he sent to the Empress and posted on Facebook explained how his plan to bring spicy Nova Scotia pepperoni to Victoria to share with friends stationed at the West Coast naval base went astray when he decided to cool the meat near the window because his room didn't have a fridge. The seagulls and pepperoni flap isn't the only wild animal story to occur at the Empress. Almost two years ago, thieves stole an iconic Bengal tiger skin that was mounted on the wall of the hotel's Bengal Lounge. The theft remains unsolved.